Sorry No Coupons. There hadn't been a new product for ironing in years - and I got sick and tired of using aerosol starch! So now I've introduced a clear, crisp starch with a lovely scent that makes ironing more enjoyable. It's in a non-aerosol bottle, so it's environmentally-friendly and you can see how much is left, too. There's no flaking, clogging, or white residue on dark fabrics. A special stain shield protects fabrics, and the product helps resist wrinkles. Best of all, it's more effective than any starch you've ever used. It's in a non-aerosol can, so it's environmentally-friendly and you can see how much is left, too. There's no flaking, clogging, or white residue on dark fabrics. A special stain shield protects fabrics, and the product helps resist wrinkles. Best of all, it's more effective than any starch you've ever used. 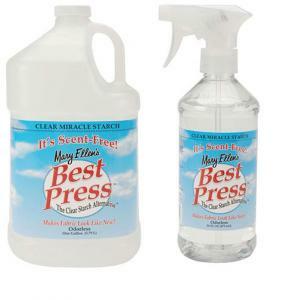 16oz Best Press Spray Scent Free Mary Ellen Products, Inc.
You asked for it. Formulated for fragrant sensitive customers, it’s the same amazing product, but zero odor. It's in a non-aerosol spray bottle, so it's environmentally-friendly and you can see how much is left. Make ironing as pleasant as possible! No more mixing starch with water or environmentally-unfriendly aerosol cans that get clogged. There's no flaking, clogging, or white residue on dark fabrics. A special stain shield protects fabrics, and the product helps resist wrinkles. Best of all, it's more effective than any starch you've ever used. Available in a 16 oz. spray bottle. Makes 8–16 oz. Bottles! By popular demand! Our new gallon refill makes 8–l6 oz. bottles. Many customers have said, “If you don’t do a refill in a hurry the landfills would be piled high with 16 oz. clear spray bottles.” From a cost and environmental standpoint, a gallon refill makes sense.